The GitHub Authenticator lets users log into your JupyterHub using their GitHub user ID / password. To do so, you’ll first need to register an application with GitHub, and then provide information about this application to your tljh configuration. You’ll need a GitHub account in order to complete these steps. 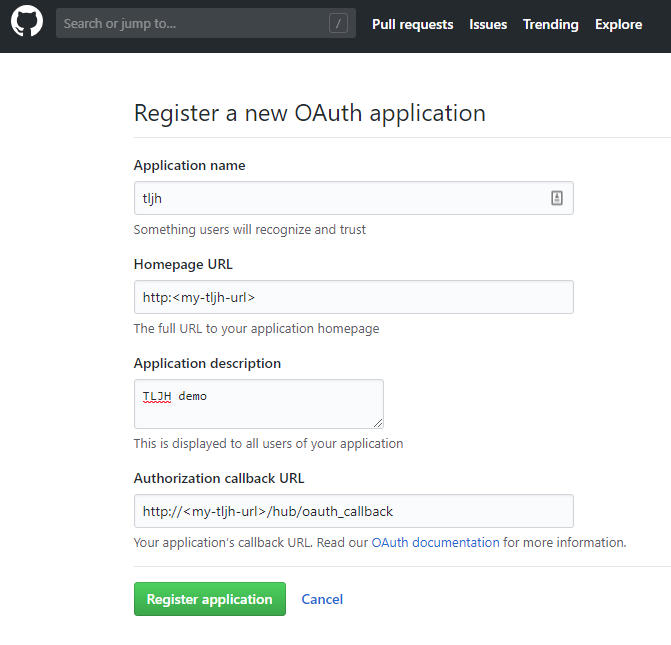 Go to the GitHub OAuth app creation page. Homepage URL: Use the IP address or URL of your JupyterHub. e.g. http(s)://<my-tljh-url>`. Application description: Use any description that you like. Click “Register application”. You’ll be taken to a page with the registered application details. 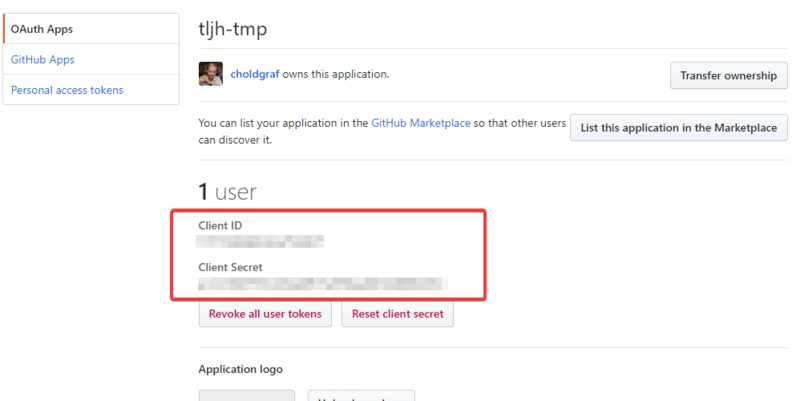 Copy the Client ID and Client Secret from the application details page. You will use these later to configure your JupyterHub authenticator. If you are using a virtual machine from a cloud provider and stop the VM, then when you re-start the VM, the provider will likely assign a new public IP address to it. In this case, you must update your GitHub application information with the new IP address. We’ll use the tljh-config tool to configure your JupyterHub’s authentication. For more information on tljh-config, see Configuring TLJH with tljh-config. Log in as an administrator account to your JupyterHub. Go to your JupyterHub URL. After you log in with your GitHub credentials, you should be directed to the Jupyter interface used in this JupyterHub. If this does not work you can revert back to the default JupyterHub authenticator by following the steps in Let users choose a password when they first log in.